Find here the list of the accommodation in Oetz. All information about the ski resort Hochoetz. No stress. Instead, relaxed skiing, cross country skiing, sledding. Experience nature on winter hikes and ski tours. Enjoy romantic evenings in authentic huts, ride on a sleigh, experience cordiality. Oetz is the perfect place to relax. 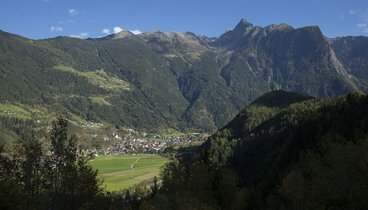 Oetz is a municipality at the lower course of the Oetztaler Ache and the center of the opening area of the Oetztal. 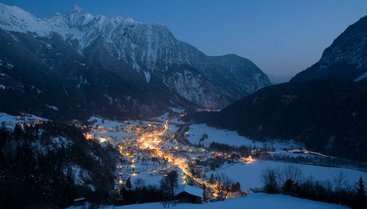 The village is surrounded by mellow forests and lawns, in the middle of the amazing peaks of the Stubai and Oetztal Alps. 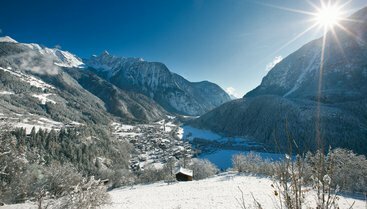 On the foot of the 3008 meters high Acherkogel Oetz is situated in a basin and is known for it’s exceptionally mild climate. The Oetztaler Ache is flowing through the village – popular for kayaking and rafting. The visitor finds a colourful mix of cozy cafés, shops and all kinds of accomodation possibilities. The old part of the city has a beautiful antique charm to it - with historical inns their facades featuring colourful wall paintings (e.g. 1611 Gasthof Stern). If you want to learn about the area’s art and handicraft the „turm museum“ is the place to go: antique furniture, paintings of different periods and photography of the area. On the hillside the late gothic – baroque parish church is overlooking the village and is also a great point viewpoint. A number of outdoor partners offer rafting and canyoning trips throughout the valley and are to be found in Oetz and the next village – Sautens. Even though it is at a height of 820 meters above the sea level Oetz has earned a south European nick name for itself; “Meran of North Tirol”. You might just get the feeling of being in charming atmosphere of southern Europe; sipping your drink in the street cafés of Oetz. 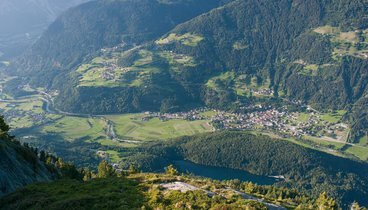 Due to its mild climate this feeling can stretch well into the autumn season.This is not to say that the traditional and the authentic Austrian culture is missing from this town. The centre of the town shows the best of it. Visit the church: “Pfarrkirche”, or the fascinating colourfully painted houses dating back to the 16th century or the museum, „das Galeriemuseum im alten Turm” to enjoy your stay here. There is a whole lot waiting for you in Oetz in summer. You could wander in the mountains; we have special guided tours to ensure that you do not miss out on the best this place has to offer. If you like it a bit more challenging, mountain bike tours are also organised for our visitors. Then there are fresh water sports: rafting in the river "Ötztaler Ache", or canyoning in the "Auer Klamm". The mountains are a perfect Para Gliding delight: experienced ones have a large area to pick from. If you are new to it but fascinated by it, you can experience it with our trained instructors who will carry you down in tandem. The Piburger Lake is one of the warmest Lakes in Tirol during the summer and it is open for all the fun and swimming. For those who just want to relax; cruise away in a boot on the Lake. There are many other fun arenas for our guests. It is no wonder once you have visited Oetz you more than likely to return to repeat the experience. Take an 8 seater ski lift from edge of the town of Oetz or a four seater ski lift from the town of Ochsengarten, a town situated nearby, and reach the ski resort Hochoetz at the height of 2,200 meters above sea level. 20 kilometres of well groomed ski slopes would be a thrill even the most demanding skiers. A wide range of lodging priced to meet every taste makes Oetz even more interesting for holiday making. In winter the Piburger Lake is completely frozen and becomes a fascinating spot for ice skating. The location of this Lake lends its beauty to other sports such as hiking too. You will find many tracks and trails around this beautiful Lake to wander off. The romantic splendour of this resort is unique and difficult to match anywhere. The Luge run at the Lake is very famous with visitors from all over the world. You can enjoy it fully flood lit up to 11:00 pm in the evening.